This is part 3 in our series about Dapper Day in Walt Disney World. Please click here to read more about Dapper Day, it’s history and purpose. Please click here to read more about what to wear and to see video from last year’s event at Disneyland. The official Dapper Day site has been updated with some more details, so I wanted to share those with you today. This information is in reference to the Dapper Day event taking place at Walt Disney World. Just as a reminder “Dapper Day” events are independently organized social gatherings neither operated by nor associated with The Walt Disney Company. I am not involved in any of the planning and I do not know the organizer personally. I am just hoping to serve my friends, (that’s you!) the Disneyways.com readers, by sharing the new information. Join the fashionable crowd SUNDAY FEBRUARY 24, for DAPPER DAY Spring 2013, and the 3rd annual spring outing at the Magic Kingdom in Walt Disney World. 3pm THE LIBERTY BELLE BON VOYAGE – Meet at the boat landing in Liberty Square and we’ll all board the first departure at 3pm or after for an elegant trip (or two) around The Rivers of America on this original attraction from 1971. 7pm THE DAPPER DERBY – Meet at Prince Charming’s Regal Carousel for a most elegant group ride! 8pm-Midnight AFTER DAPPER DRINKS at the tiki-themed Tambu Lounge in the Polynesian Resort, main building, Monorail level. Dapper Day organizers stress that event hours and schedules are merely suggestions and they highly encourage you and your party to enjoy the park at your leisure. Another note about dress – Dapper Day events celebrate the tradition of stepping out in style. Any elegant fashions, from vintage-inspired looks to the latest haute couture, are encouraged. Active and retired service members, please consider wearing your dress blues or service uniform to Dapper Day! 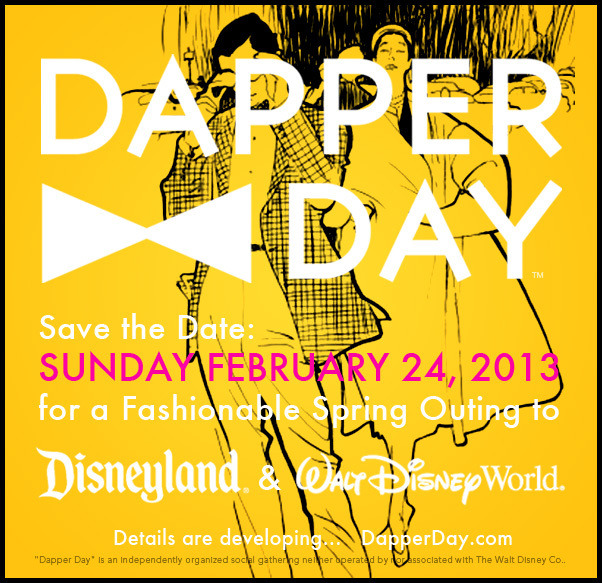 Please click HERE to visit the official website for Dapper Day. I think I missed the link to register for the DL 9/6/13 Fall Soiree. Could you please send it to me.